Good news for motorists in the northeast metro. 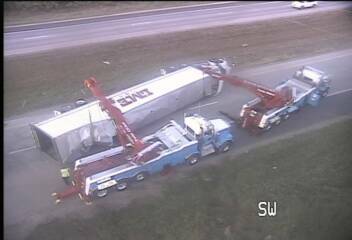 The Minnesota Department of Transportation reopened westbound I-694 after a semitrailer truck flipped over at McKnight Road. The lanes had been closed for nearly five hours. This was the scene earlier this morning. There was no immediate word on whether there were any injuries associated with the wreck, which was reported about 2:40 a.m.
Traffic was diverted onto Hwy. 36 during the closure. At 8:30 a.m., things were starting to loosen up from 694 to I-35W. 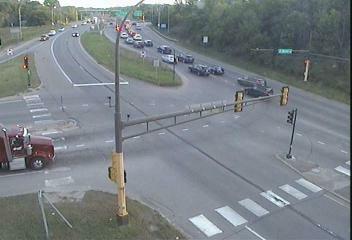 As motorists use alternate routes, traffic is heavier than normal on westbound I-94 from Woodbury into downtown St. Paul. The drive from I-694 to I-35E was running between 15 and 20 minutes as of 8:30 a.m.
Traffic is also slower than normal on northbound Hwy. 52 approaching Plato Boulevard and northbound Hwy. 61 at Warner Road. The newest hotspot at 8:30 a.m. was on northbound I-35W in south Minneapolis. 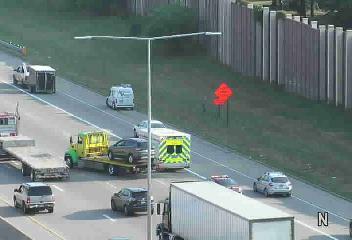 A crash was in the final stages of clearing, but two right lanes were blocked at 50th Street. Inbound I-394 is running slow due to a crash at Penn Avenue. That's adding an extra 5 minutes to the commute into downtown Minneapolis.